President Obama expanded use of family detention camps a couple of years ago to include lockups for thousands of Central American women and children seeking asylum at the Southern border. That’s been a gold mine for the corporate prison industry. 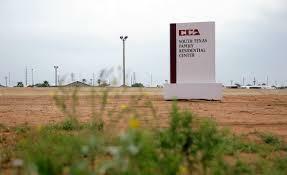 Private prison giant CoreCivic--formerly known as the Corrections Corporation of America--has put up record profits running a 2,400-bed family jail in the tiny city of Dilley. 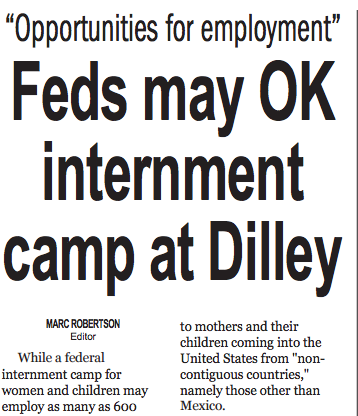 But some in Dilley worry hosting the hub of a controversial family detention policy hasn't paid off for locals. Dilley native Gilbert Ortiz stares blankly at his hometown’s humble main drag from a nearby park. Ortiz points to the hard-to-miss statue of a half-eaten watermelon—wrapped in Christmas lights. Today, Dilley is known for other things. Immigration authorities hastily opened the largest immigrant detention center in the country here 2 years ago, in an old oil worker ‘man camp’ at the edge of town. A screenshot of the headline from the Frio-Nueces Current Newspaper. The Dilley City Council approved its agreement with the private prison company and the man-camp owner in October 2014. CoreCivic agreed to prioritize hiring Dilley residents to fill 600 jobs, but Asuncion hasn't seen that. The council’s agenda promised the project would provide $6.9 million in direct economic benefit to Dilley, but it's unclear that's come through. The agreement--and appraisal district data--show the city should have brought in less than $2 million in revenue sharing from CoreCivic and property taxes from the center since then. Dilley has also taken out millions in bonds called certificates of obligation—without voter approval—for city projects including a water and sewer line upgrade for the detention center. Perez says there’s no doubt the massive detention facility is good for Dilley. It filled some of the void left by declining industries. He admits the city put on $5 million in debt in 2014 to complete projects including the water and sewer upgrade for the detention center. The Department of Homeland Security claimed it was reviewing its use of private prison operators altogether, but that review didn't stop the agency from approving a contract for the Dilley facility that keeps the center running until 2021, but Perez says an executive order could change that. In the new contract, CoreCivic agreed to cut costs at Dilley by 40 percent, mostly through reductions in staff. A woman who works for a CoreCivic subcontractor says her pay was cut by more than 30 percent. The woman doesn’t want to be named because she just took a job with the same company in another state. CoreCivic is advertising starting wages of $16.43 an hour in the local paper. The company can't say how many of its workers are from Dilley, but the woman says it’s just a handful. She also says her colleagues quit as a record surge of Central American immigrants entered the country. Nearly 600 people from across the country gathered to march and rally in front of the Dilley Detention Center in May 2015. “From what I gather, a lot of people were putting in a lot of overtime, because they just didn’t have the manpower, and it makes you wonder if everybody is even getting processed properly,” she says. While city leaders hold out hope the controversial facility will pay off for Dilley, some residents feel used. Jose Asuncion doesn’t want his neighbors paying sky-high tax and water rates to pad private prison profits. And as the son of a Salvadoran immigrant, says the plight of detainees is personal. “At a different time, different decade not too long ago—in my lifetime, I could have been one of the kids there,” Asuncion says. Meanwhile, federal immigration officials are struggling to find other South Texas towns willing to build a new facility to detain women and children. Community push-back killed proposals in Dimmit and Jim Wells counties earlier this year. 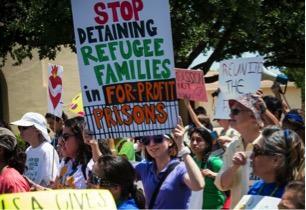 What's Next For Texas' For-Profit Immigrant Detention Centers? U.S. Immigration and Customs Enforcement says the release of hundreds of women and children from South Texas detention centers over the past week were scheduled as part of "normal operations"—and not in response to a court ruling last Friday barring such facilities from getting childcare licenses. Jonathan Ryan is executive director of San Antonio’s Refugee and Immigrant Center For Education and Legal Services, a group that assists these asylum-seekers. Ryan told TPR that the recent surge is far from routine.